Now is the perfect time to fish if you want to catch Rainbow Trout. 4,000 lbs were planted earlier this week, and although they are still acclimating to the lake they are starting to become the common catch. Nightcrawlers are great to use as well as Panther martins, Kastmasters, or any spoon. They are between 103 lbs on average. Bass have slowed down a bit but are still fairly common. The cooler water temp has forced them deeper, so using dropshot or any deep diving bait should get their attention. Micetails and nightcrawlers are recommended for bass. Crappie and bluegill are still coming up anywhere there is structure or any rocky shelf; crappie jigs, atomic tubes and mealworms work best. 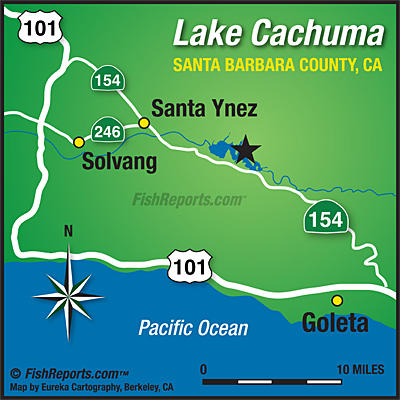 Catfish are everywhere along the bottom, larger one's have been caught mostly by the dam or to the east (closest to Hwy 154). Nightcrawlers and frozen mackerel are the common bait for catfish. Carp are starting to show up, but mostly being caught by bow.